How Long Can MAS Airline (Penny Stock) Survive?! As you know, Malaysian Airline (MAS) has been hit with multiple tragedies, one being the MH370 tragedy and the fact that it keep on bleeding RED for so many years, don't really help the company stock price much. It has now entered the 10++ cent domain. My foreign colleague triggered alarm bells from his friends, when he mentioned that he is travelling to Malaysia using MAS airline. They joked that they (his friends) should start saying goodbye to him in case another missing plane incident happens. That shows how bad the current image for MAS airline for international travellers. Suddenly, everyone in the world knows MAS stands for Malaysian Airline (Malaysia's national carrier) due to the immerse international global news coverage for the MH370 tragedy. Why am I saying this? There is still alot of people in the west that DO not know where is Malaysia located. But i bet after MH370, alot of people would know where Malaysia and why avoid MAS airline for the time being. Today, I am seeing another high volume spike for MAS stocks. During the evening, it seems that someone is supporting the stock price from further plummeting. 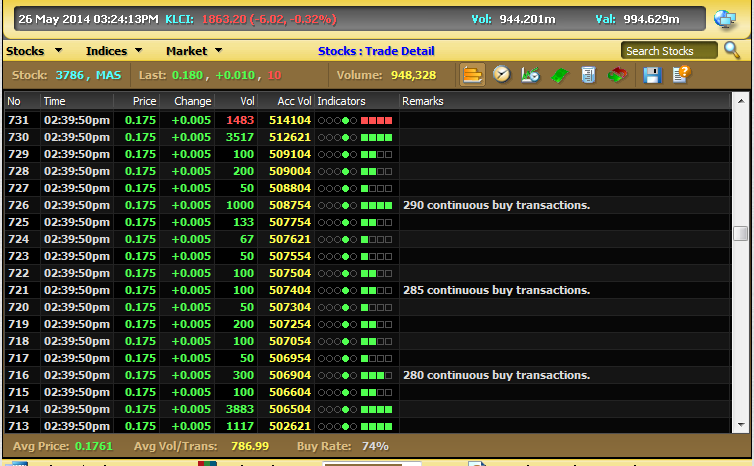 From the screenshot above, there are ~290 consecutive buy transactions!!! Maybe it is from some die hard punters or our beloved EPF trying to stem further stock price decline. Well, for those die heart punters, they will likely think that the Malaysian government WOULD NOT POSSIBLY allow MAS to go bankrupt, hence there is profit to be made when MAS starts to bounce upwards due to government support. Nevertheless, point to remember is that Japan Airlines (JAL) was allowed to go bankrupt to clear its debt. So the question is that how long MAS can go on bleeding money before being bailed out?